How can helping someone actually be hurting someone? Can helping someone end up as enabling someone? Jesus said we should clothe the naked and give food to the hungry, so the command to help others shouldn’t be a surprise for Christians. That is our calling. Jesus once said, “For I was hungry and you gave me food, I was thirsty and you gave me drink, I was a stranger and you welcomed me, I was naked and you clothed me, I was sick and you visited me, I was in prison and you came to me” (Matt 25:35-36), and maybe you’ll be like the righteous and say, “Lord, when did we see you hungry and feed you, or thirsty and give you drink? And when did we see you a stranger and welcome you, or naked and clothe you? And when did we see you sick or in prison and visit you” (Matt 25:37-39), but the Lord Himself will say to you, “as you did it to one of the least of these my brothers, you did it to me” (Matt 25:40). There is, however, a flip side that is tragically and radically different. When Jesus comes, He will say to some (perhaps many?, i.e. Matt 7:21-23), “I was hungry and you gave me no food, I was thirsty and you gave me no drink, I was a stranger and you did not welcome me, naked and you did not clothe me, sick and in prison and you did not visit me” (Matt 25:42-43), but the unrighteous will say, “Lord, when did we see you hungry or thirsty or a stranger or naked or sick or in prison, and did not minister to you” (Matt 25:44), so Jesus reminded them that “as you did not do it to one of the least of these, you did not do it to me” (Matt 25:45), and the consequences of doing nothing for Christ will be that they “will go away into eternal punishment, but the righteous into eternal life” (Matt 25:46). If you are doing nothing for others, then you are doing nothing for Christ. A person isn’t saved by works but a saved person has works to walk in that God prepared for them long ago (Eph 2:10), and to not walk in these good works is the same as not doing anything for Christ. Doing for the least of these is doing it for Christ; not doing for the least of these is not doing for Christ. That’s abundantly clear in Scripture. It’s good to help others, but it’s also good to help them help themselves. We had a former homeless man who couldn’t get a job. His wife left him and he was left with nothing, so we gave him a few jobs around the church to do until he could get back on his feet…and he did them well. When he later tried to find a job, we could honestly offer our recommendation, and as it turned out, he got a job, but if we had only given him something to eat and drink, and done nothing more for him, he still might be homeless to this day, but we offered him some help and he helped himself. Most people I know that needed help didn’t want a free hand out, they wanted a hand up…and that way they could have some self-respect and dignity by working for what they earned. Of course we have a fund that we do help people when we can, and we don’t say, “Okay, we’ll give you money if you do this for us,” but in some cases, it’s better to help them by helping them help themselves. The old proverb is true; “give a man a fish and you can feed him for a day, but teach him to fish, and you feed him for a lifetime.” We can help someone, but if we only give, give, and give, we might be enabling them to live a lifestyle where they don’t have to work because their only goal might be to survive so they don’t have to work. If someone can’t work, that’s a different issue, but when someone can and they refuse to, we can only help them so much because they first have to learn to help themselves. The Apostle Paul said if a man doesn’t work, he shouldn’t eat (2nd Thess 3:10). Sounds harsh, but an empty stomach motivates a person; or at least it should. I know of several missionaries who do things for a few local villages in Africa. They dig wells and bring seed for the villagers to grow food with, but what we see emerging today is what is called a “social gospel,” and to me, it’s no gospel at all, because to offer a village water without telling them about the Living Water (John 4:13-14) is only putting a band aid on their problem. And giving them seed to plant without planting the seed of the gospel is to make them malnourished as far as God is concerned. Its fine to feed the hungry but if we only feed them food and not offer them the Bread of Life (John 6:35), then we’ve failed our mission for Christ. We’re only making the world a better place to go to hell in. Unless we offer the gospel, helping others is only a stop-gap measure to their suffering, but offering the eternal life through Jesus Christ will end that suffering someday (Rev 21:4), and make them think about today as being nothing compared to the glory that’s coming (Rom 8:18). Don’t get me wrong, we can help others, but if we only help them physically and leave them in a spiritual wasteland, we’ve not made an eternal difference, and that’s what God is interested in. How can we know the difference between helping someone and enabling someone? That’s not always easy to know because the human heart is so desperately wicked and only God can know it (Jer 17:9), so we can very easily be deceived by people we think have good intentions, so it takes prayer, perhaps the counsel of others, and seeing how the person you’re helping responds. Is there a sense of gratitude? Do they want to sincerely break out of their situation? Can you see an earnest desire in them to change? Is there evidence of the person striving to make it better? If all of these things are missing, I would be cautious because in our good intentions we could actually be enabling someone to stay where they’re at and not help them change for the better. 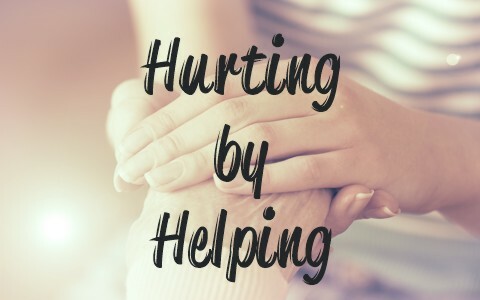 Everyone needs a little help now and then, so it’s good to help, but it must be mixed with wisdom, and that’s where we can get some help because James wrote, “If any of you lacks wisdom, let him ask God, who gives generously to all without reproach, and it will be given him” (James 1:5). To be honest, I could use all the wisdom I can get. How about you?